Today’s technology unleashes new, digitized information resources with immense scale and speed. This Article examines one such resource — the archive of audio recorded proceedings of the United States Supreme Court — appraising, for the first time, its value to those who study and practice environmental law. From hundreds of hours of audio across six decades, a history of environmental litigation sounds forth, imparting rich lessons on advocacy, judicial reasoning, and the role of the Court in environmental law’s development. The Article organizes itself in three major parts, furnishing insights on: oral advocacy in the environmental docket; the voices from the bench; and the audience for prospective engagement with any selection or subset of recordings. Serving partly as a listener’s guide, the Article defines the reach of environmental litigation in the audio archive and demonstrates its unique value as a tool for learning and the professional betterment of environmental law scholars and practitioners. Tomasovic explains that argument audio hosted on the Supreme Court’s website presently begins with the October 2010 Term, while recordings going back to 1955 are at the Oyez website. 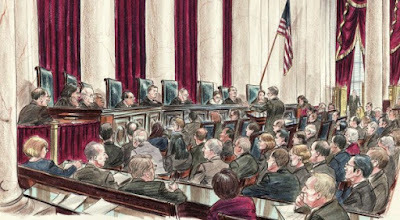 The article's Appendix B "compiles the list of available oral argument recordings for more than three hundred Supreme Court cases where environmental protection or natural resource concerns were at stake", and also "labels, using keyword tags, the identity of these settings under the rubric of the environmental burdens, risks, or amenities at issue in each case". Environmental history, broadly conceived, is the “history of the role and place of nature in human life.” The Supreme Court and its bar are assuredly actors in environmental history, but there are many different perspectives for considering the Court or its jurisprudence through the lens of environmental history. In the early development of this history subdiscipline, its scholars tended to produce political history concentrating on environmental politics. As easily as this could also be done for the Supreme Court’s case history, not all cases of historic importance from the angle of environmental politics have environmental interests at stake. Since the 1980s, environmental history has become a more florid, complex garden of ideas: variously applying scientific detective work to reconstruct past environments; studying the interwoven relationships between societal modes of production and dynamic, often human-impacted environmental settings; and studying ideas and cultural assumptions about “nature.” Aspects of the Court’s environmental docket touch on all these areas. An original action may be an ownership dispute occasioned by the meanderings of a river and the more or less unstoppable forces of fluvial geomorphology. Likewise, disputes over pollution control and environmental contamination may work their way to the Court with a distinct geographic and temporal setting. But, in another sense, the Court’s environmental cases are flashes of society-wide efforts to define and regulate environmental impacts, burdens, and amenities. Practitioners, advantaged by their experience, may see these disputes to have underlying fact patterns that are neither unique nor isolated. As should also be expected, the Court’s environmental docket, and its corresponding soundscape, memorializes and traverses legal conflicts based on geologic changes and societal changes in subsistence, production, and consumption. For example, we hear the Court engage outmoded polluting technology, outmoded means of pollution surveillance, and globally notorious incidents of environmental contamination. By examining the changing composition of the environmental docket, one may even discern past areas of special interest and scrutiny from the Court that have now passed into memory. These broader observations would do little to cabin the subject of the Court’s role as an actor and percipient witness in United States environmental history; they implicate questions of historical materialism that are continental, if not global, in scale. In contrast, the Court’s encounters with ideas of nature are susceptible to narrower and more productive inquiry. As a matter of institutional function, the Court does not passively hear disputes and instead actively seeks to answer questions of law based on the record and arguments before it. In this capacity, the Court’s ideology of nature is present, though its salience is not often acknowledged. The oral arguments in three older cases [I omit the discussion of the third below--DS] give special insights into the Court’s environmental worldview. All three of them evince older, outmoded ecological understandings and tend to throw into question whether viewpoints on nature embodied in the Court’s decisions—and underlying deliberations—are reliable. As a first example, United States v. Republic Steel Corp. was a landmark case for holding that the deposit of industrial waste created a forbidden obstruction to the navigable capacity of a river under the Rivers and Harbors Act of 1899. Surprisingly, during oral arguments, counsel for respondent argued what was then an already antiquated theory: that running water purifies streams. Counsel stated, “It is true that if you discharge putrescible material into flowing water, it will oxidize that material so that it will no longer be putrescible, noxious.” Such rotting material, he continued in his explanation, does not disappear, but the “bad odors and so forth, will have disappeared” and such material will have “been purified from the standpoint of public health.” Counsel presents an apparent variant of a nineteenth century hypothesis, once predominant even among engineers, that has long stayed lodged in the imagination of laypersons; however, bacterial research during the 1880s and 1890s refuted the theory. Indeed, it had already been decades since the Supreme Court had considered evidence, however attenuated, that bacillus of typhoid might survive a multi-day, 300-plus-mile downriver trip from Chicago to St. Louis. Strikingly, for this case noted as a model of environmental legal innovation, the Court was audience to particularly retrograde environmental argumentation. The claim that running water purifies streams is more suited to a bygone era when limits on the diluting power of waterways were less apparent and contaminant detection methods were less sensitive. Oral arguments in Citizens to Preserve Overton Park—a famous administrative law case on the clash between highway developers and park preservationists—provide another example. During arguments, a Justice asks the Solicitor General to explain the meaning of the term “climax forest,” noting it was used in the petitioner’s brief. The Solicitor General had no understanding of its meaning. This term invokes an older, value-laden principle of ecology that was already passing out of favor in scientific circles. The ecologist Frederic Clements had earlier pioneered a concept of plant succession whereby a biotic community reaches a stable state known as a “climax.” However, by the mid-twentieth century, the concept was already criticized as “too monolithic and too teleological.” As environmental historian William Cronon writes, even putting aside human influence, “[t]here has been no timeless wilderness in a state of perfect changelessness, no climax forest in permanent stasis.” Whether the inquiring Justice was able to locate a definition of climax forest before voting on the case at the Justices’ Conference is not known, but it remains remarkable that in a case concerning the protection of “natural beauty” in Overton Park, the petitioners employed terminology of plant ecology to describe its features. That chosen term perhaps meant to evoke ideals of natural equilibrium and the absence of human interference, but this message was lost on the Justices. That Justice Marshall’s opinion for the Court says nothing of a climax forest at Overton Park is just as well, considering the scientific moorings of the concept were already long criticized. Justice Rehnquist is to some extent unfairly maligned as the author of the opinion in United States v. New Mexico. That decision denied the claim of the United States to reserved water rights for use in the Gila National Forest, and Justice Powell wrote a celebrated dissent that criticized the Court for envisioning national forests as “still, silent, lifeless places.” To Justice Powell and his fellow dissenters, “forests consist of the birds, animals, and fish—the wildlife—that inhabit them, as well as the trees, flowers, shrubs, and grasses.” According to a conventional assessment of the written opinions, Justice Rehnquist’s position represents a failure to understand ecosystem needs. It has gone unnoticed, however, that Justice Rehnquist asked the most ecologically sophisticated question at oral arguments, namely whether the respondent would concede the right to water should differ “with respect to phreatophytes within a National Forest.” The answer to the question of phreatophytes—plants that survive by having their roots in touch with moisture—may have had a largely unacknowledged impact on Justice Rehnquist’s thinking about the case. Counsel persuasively explained that the “high mountain forest,” primarily made of ponderosa pines, did not have a big phreatophyte population dependent on stream flow. This moment also illustrates how the Court’s written decisional history does not necessarily concretize all the reasoning in a case or make use of all relevant facts. While authored opinions may reflect a Justice’s chosen, impressionistic brush strokes, the Court’s sound recordings can often, as here, give a more vivid, photorealistic picture of a case.